At 1.5 to 2 inches (4 to 5 centimeters) long, the giant hornets are found across many parts of East and Southeast Asia and are especially well known in Japan. They’re among the more dangerous venomous insects of their type, Kimsey said, though others, like Africanized bees and yellow jackets, can cause similar problems. While the hornets don’t typically swarm humans in such numbers, they’re well known for their ability to quickly decimate a hive of thousands of honeybees, leaving behind a trail of severed heads and limbs. The hornets routinely fly miles from their nests and employ scouts to locate a bee colony and then mark it with a special pheromone that attracts their allies to attack, destroy, and occupy the hive. With their huge size advantage, the hornets typically make short work of the bees, unless the victims are able to eliminate the advance scout before it can summon others. They sometimes do so with an incredible defense—swarming the hornet in a ball and literally cooking it to death. Why Are Hornets Attacking People? It’s unclear exactly what factor or factors has led to the hornets’ deadly season of human attacks. Huang Rongyao, an insect expert with the Forestry Bureau of Ankang City, told Xinhua that local vegetation growth has increased hornet habitat, and that two months of hot weather have made the insects much more active. Ankang is one of the cities most affected by hornet attacks, along with Hanzhong and Shangluo. In the meantime, staying well clear of the hornets is the best route to safety, experts advise, but that’s often easier said than done. The insect often locates nests underground or even on buildings, which puts them directly in human territory. Disturbing them or merely passing too close for the hornets’ comfort can unleash a fierce retaliation. Some attacks seem especially unprovoked. In September, Xinhua reported that a swarm attacked a school in southern China, injuring 30 people—all but one of whom had to be hospitalized with multiple stings. 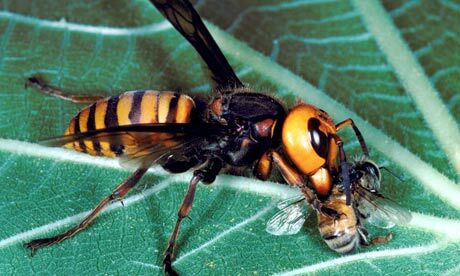 An Asian hornet (vespa mandarinia) eats a honeybee. The sting of the highly venomous giant hornet, which measures about the size of a human thumb, can dissolve human tissue and cause kidney failure.